It is that time of year again for the Sunshine Hill Climb. This Boulder bike race is a killer category 1 climb that ends with about four miles of steeeep and deeeep dirt! Yep you got it. Not only is this a 3,000ft climb in 8 miles, but you also have to ride it with some solid tires to help prevent pinch flats and gain traction. I usually get dropped from the front group within about 2k of the start and then slog it out hoping the fields that started behind me don't catch me before the finish. I can't say I've always succeeded. Oh well, I'll give cerdit wher credit is due. There are some fast mountain goats in the masters and cat. 4 categories. The screen shot I posted here can also be viewed in detail by clicking here. 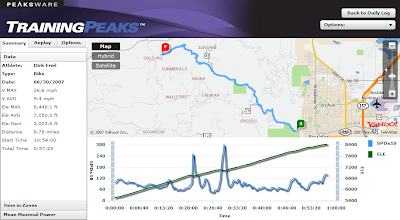 This was a file of mine from a training ride this past November with Michael Barry. We did this on our cross bikes and instead of dirt we were climbing on snow and ice. Alan McCormack wins Ft Collins Criterium! Some athletes fortunately never stop showing us the gift they were born with. Winning races just never leaves their blood and as long as they keep racing others are amazed by their abilities. 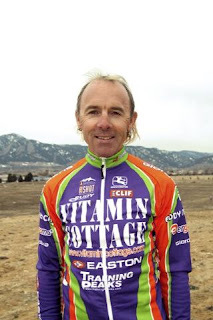 I'm thankful to say I have Alan McCormack as a teammate who even at age 50 continues to amaze the crowds in local Colorado criteriums! This past weekend Alan showed his winning ways once again at the Pro-1-2 criterium in Ft Collins, Colorado. Alan won the sprint out of a 12-man break. If Alan wasn't on my side I'd have to try and beat him and that is never fun when your hitting a corner at 40+mph and a little leprichan of a man is sneaking up on your inside to take the victory. Instead I'm happy to be the guy swinging off with half a lap to go to let Alan duke it out with the young blood. If you want to see just how long Alan has been winning check out this site How many people can you name racing at the Pro-I level in America today that can say they have raced a grand tour with Eddy Merckx (Alan raced the '77 Vuelta with Merckx and also races on a Merckx frame the past three years)! Alan just might be the only one in existance in the US. Get Alan talking about racing in the 70's and he'll fill your head with the funniest bike stories you've ever heard. Keep it up Alan. I'm glad you're on my side.